The most awaited moment of this fall has arrived – the Grand Opening of the new season of MISS USSR UK! The launch party was held in one of the top clubs in the world, DSTRKT, in the heart of Central London, on the 16th of November 2017. 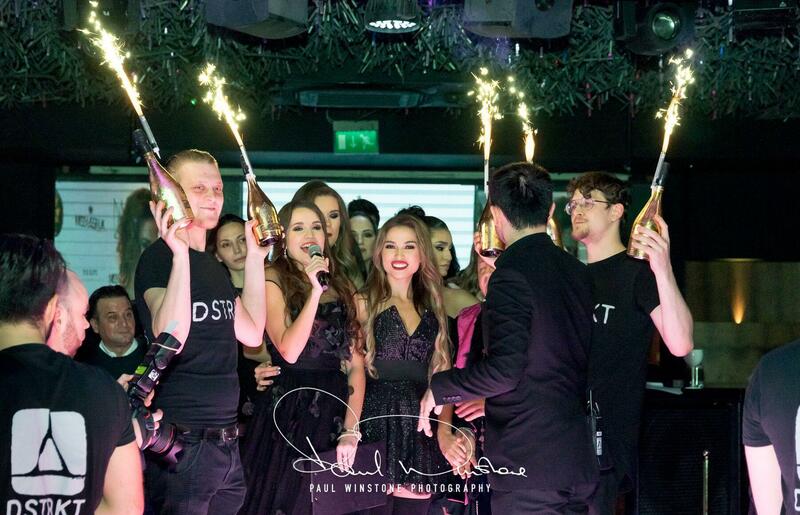 The Grand Opening was invitations-only event, celebrating the exclusivity and success of the previous five seasons. The list of the guests included remarkable people from different industries. Prominent and successful producers, businessmen, singers, models, influencers and other public figures got together to support the prestige beauty pageant and celebrate the start of the 6th season. On the arrival to the venue invitees enjoyed canapés and drinks, were photographed on the red carpet and had a chance to network. Gentlemen in tuxedos and ladies in evening gowns emphasized the first-class status of the event. Everyone looked absolutely stunning while enjoying the exclusive show. The host for the night was talented Irina Dedyuk, one of the most vibrant contestants of the world-famous show X-Factor UK, recording and performing artist from Los Angeles and ambassador of MISS USSR UK. She opened the show with an impressive performance that highlighted her charming voice and unique talent. Following Irina’s performance, Damon Elliott, an American producer and rapper, Grammy winning artist, took over the stage with some of his worldwide famous tracks. Damon worked with such celebrities as Beyoncé, P!nk, Jessica Simpson, Christina Aguilera and Britney Spears during his extraordinary career. Yulia Sinitsyna, Rhythmic Gymnastics European Champion and a prominent participant of “Dancing with the Stars” TV Show, has enchanted the audience with her dazzling performance along with Iryna Dedyuk magnificent singing. It was the part of the fabulous new entertainment act designed by MISS USSR UK team – MISS USSR Queens Show. This magical act features the winners and runners up of the show, who impress the crowd with their grace and fascinating beauty. After that Nicole Cherry, a Romanian pop and reggae singer, who won the 2014 Zu Music Award for “Best Breakthrough” artist, performed for the guests. Nicole’s songs hit №1 place in world music charts. And finally, the moment that everyone was waiting for has arrived. MISS USSR UK contestants in elegant and sophisticated evening dresses by Selezza London have appeared on the stage looking like goddesses in their fabulous gowns. SELEZZA, an affordable luxury fashion brand, which was established by two designers, promotes the idea of timeless design and femininity. The brand offers elegant occasion and day to evening wear for modern, cosmopolitan women looking for sophisticated and flattering silhouettes. This philosophy fits perfectly with the vision of the contest, empowering women to be the best version of themselves and continuous self-improvement. Julia Titova, CEO of MISS USSR UK, who as usually looked fabulous in her amazing black dress, proved once again, that MISS USSR UK is much more than just a beauty contest. Julia and her team have prepared a splendid entertainment show for the opening party. They have also opened up a platform that created great opportunities for all the participants of the show, including contestants, partners and investors. This is a platform for successful and progressive people. MISS USSR UK is more than a traditional beauty pageant. It is an exclusive and original show, which keeps developing. Thanks to the partners from all around the world. Once again limitless beauty has hit the capital of Great Britain and is preparing more of spectacular events to be part of later this season.